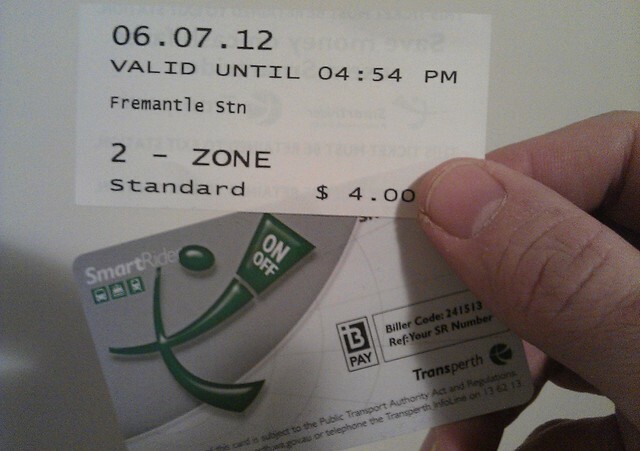 So I thought I’d compare Perth’s SmartRider against Melbourne’s Myki card. This issue is critical for tourists and other occasional users of the system, who may have no wish to buy a reusable card. Judging from the initial response to Myki’s withdrawal of short term ticket options, I suspect there’s something of a pyschological barrier to buying a Smartcard for a small amount of travel — even if it costs as little as $3 (for a concession). 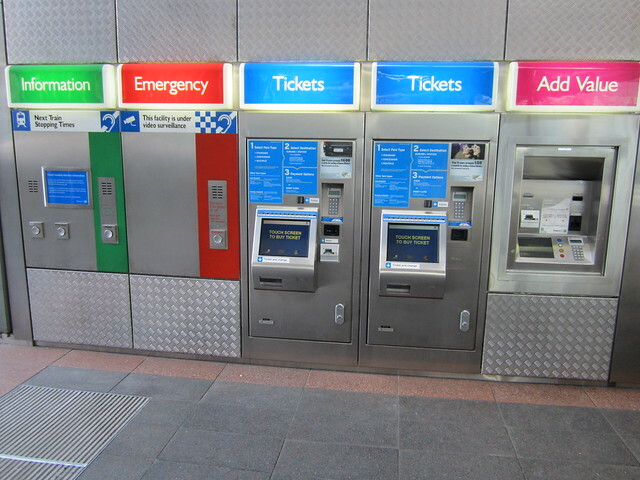 Perth: No problems here; paper tickets (printed by vending machines which appear to be the same hardware as Myki’s vending machines) are widely available. They are more expensive than travelling on SmartRider, and at gated stations require you to line up for visual inspection — thus another encouragement for regular users to switch to smartcards. Melbourne: Once Myki is completely rolled-out, there’ll be no paper/short term ticket option. This is already a reality at all unstaffed railway stations, and is already causing complaints, particularly for concession users who don’t yet have a Myki, because you can only buy a concession Myki from a human (eg at a staffed station or retail outlet). Perth wins on this point. Interstate primary or secondary students may purchase a Tertiary SmartRider. Interstate students are not entitled to the 50 cent student fare. The weakness of Smartrider is the availability. You can’t buy them from machines; you buy them over-the-counter from a relatively small number of stations, or from retail outlets. In the case of Fremantle, it’s a retailer in the station, who reckoned we couldn’t get any kind of non-full-fare card at all without paperwork stamped by the kids’ school. I wasn’t going to get into a debate with the lady, so we just got paper tickets for the kids — fortunately they are easily available from the station vending machines in Perth. Melbourne: adult cards are available from any station vending machine, plus hundreds of retailers, and station booking offices. Concessions are only available from retailers or station booking offices (which is causing problems for some people, given the lack of a short term ticket option). Buying a concession doesn’t require paperwork, though if you encounter inspectors, you may have to prove your eligibility. Myki cards are cheaper than SmartRider cards; $6 for an adult Myki vs $10 for a SmartRider. Even leaving aside the confusion over concession SmartRiders, Myki wins the points here for much wider availability. Both systems allow “set and forget” auto load — in SmartRider’s case this gets you an additional discount on your fares. Both systems also let you load credit via BPay. Myki also has options for credit card top-up online, which SmartRider doesn’t appear to have. Perth: you can add value to your card on any bus or ferry, but at railway stations it’s a lot more restrictive — in fact you can only add value onto your card at 18 stations. There are also 4 “TransPerth Info Centres”, and about 60 retail outlets. SmartRider is somewhat restrictive in the topup amounts. There’s a minimum of $10 on buses and ferries (which makes sense to prevent delays, especially on buses), but this also applies at station topup machines and retail outlets. Melbourne: eventually it’s expected you’ll be able to top-up a Myki on a bus, but not on a tram. You can top-up at any railway station, and at about 800 retail outlets. Myki retail outlets do impose some limits on top-ups (generally $1 according to the web site), and it’s not clear what rules will apply on buses (regional buses have the same lower limit, but this results in delays as some people top-up their Myki with their fare amount every day). For station machines it needs to be at least $1 — I know of some people who when passing, if there’s no queue, simply dump all their coins in. A good way to get rid of change. Despite no tram top-up option, Myki wins on this. SmartRider wins this hands down. I found it consistently lightning fast. In contrast Myki is patchy — sometimes fast (but I’ve never seen it as fast as SmartRider) and sometimes painfully slow. With SmartRider I was able to walk through the gate without breaking step. Try that with Myki, even with the new gates, and you’d collide with the paddles. SmartRider continues to use the terminology “tag on, tag off” — Myki originally used “scan on, scan off”, but moved to “touch on, touch off” in part due to slow response times. I dare say if Myki was as fast as SmartRider, there’d have been less need to remove touch-off from trams… which would mean City Saver fares could have been kept (and indeed more flexibility with regard to future fare structures could have been maintained). I suspect it’s in part because Myki devices are built on top of a general-purpose operating system (Windows CE)… I get the sense that many Smartcard devices in other cities are pretty much custom designs, without the overhead of that same kind of general-purpose operating system slowing them down. The fare structure is somewhat independent of the ticketing system, but of course do influence each other. Melbourne is two zones with overlaps, though some outer-suburban areas such as the farthest reaches of the Mornington Peninsula will become the new Zone 3 and zone 4. More zones will cover most of the rest of Victoria. The old 2-hour and daily fares (“Myki Money”) still apply, with Weekend/public holiday discounts/caps. To get the further discounted weekly, monthly to yearly (28-365) “Pass” options, you have to buy these in advance. Perth has nine zones, but this also covers some surrounding areas, for instance Mandurah which is about 70 km from the CBD (a bit further than Pakenham is from Melbourne’s CBD, is zone 7. Zones they don’t seem to have overlaps, which probably doesn’t matter given the larger number of them, and makes the system a bit easier to understand. With more zones, the cost increment for crossing a zone is much smaller — as little as 80 cents (cash fare) — which probably reduces the issues with Melbourne’s zone 1 — lots of people drive to the zone boundary to get a much cheaper fare. A fare is 2 hours if it covers up to 4 zones; for more zones it’s 3 hours. A daily cap of $11 applies. There are no weekly or monthly discounts or caps, and there appear to be no off-peak or weekend/holiday discounts. When buying a cash/paper ticket from a ticket machine, you tell it how many zones you want. The resultant ticket has the originating station and the number of zones. It’s not crystal clear to me how you are prevented travelling in both directions from there — I guess not many people take advantage of it. SmartRider gives you a 15% discount on the cash fare, but switching to auto top-up makes it a 25% discount. Melbourne: Many would know that Myki has been troubleprone, and is still not fully rolled out. The cost is huge ($1.5 billion over ten years, including running costs — about two-thirds of it is the start up and installation). Perth: SmartRider is also not without its problems. The system was cheaper to rollout (apparently $35 million, presumably excluding running costs), but the public transport network is smaller, and there are much fewer vending/top-up machines around the system, as well as a much smaller network of retail agents. With a little research, one might be able to come up with a “per device” figure comparing the two systems. I got the impression that fewer Perth railway stations are staffed, and even at those that were, the staff won’t sell you tickets — though they did offer to help me with the machines. 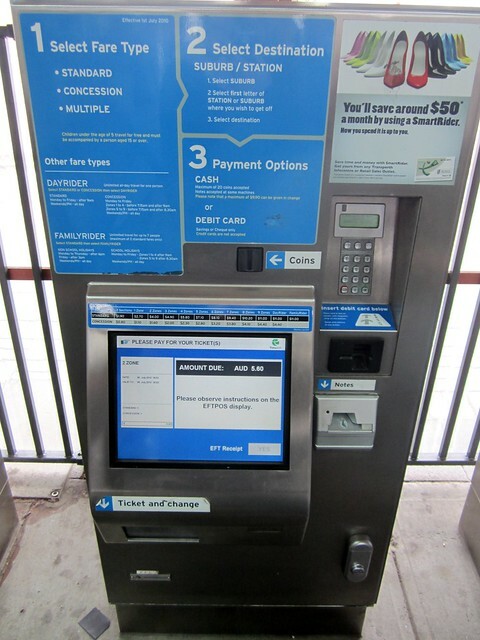 I also noticed that on a SmartRider add value machine, the card is inserted into the machine, which avoids the Myki problem of it sitting in a cradle on the front of the machine, and the possibility of it being removed before the transaction is complete — and also the issue of transactions not being cancelled properly. Myki is actually better in a number of ways. It’s significantly cheaper and easier to get a card, and to top it up once you’ve got it, and these factors are undoubtedly important. But SmartRider is better on a couple of really critical areas: on speed of touching/tagging and on the availability of short term paper tickets for those who don’t have a card. An ideal system, I suppose, would have the wider availability of Myki, but the high-speed response times and short term ticket options of SmartRider. A great comparison. And Myki comes off pretty well. Incidently, the issue of concession cards for school students is (almost) irrelevant in Victoria as a student can get children’s fares until they turn 17. What is the oldest a person can travel with a child’s ticket in WA? Only until 15th birthday in Perth, though up to 17 for regional services as far as I remember. I’m personally of the opinion that SmartRider is more a marketing success than anything else, the PTA/Transperth managed to keep it relatively low profile while the genuinely successful Mandurah Line attracted criticism by the boatload from the papers. After all, it still doesn’t support the full fare structure so paper cash tickets are sometimes cheaper, as mentioned the purchase and top up facilities are limited, doesn’t easily support child concessions and – surprise surprise – encountered a whole two-and-a-half-year delay in introduction. By the way Daniel, Perth’s “off peak discount” is being able to take children on an all day cash ticket on weekends and holidays, plus after the afternoon peak on school days. Doesn’t apply to SmartRider. Just checked, it’s actually until 16th birthday on Transwa regional services. Hehe, I have dumped around $200 worth of coins that I had sitting around the house into Myki machines. I would have put more in there, except they don’t take 5c coins. At $1.5bil compared with $35mil (even if it was $500mil) Myki comes of looking pretty bad. When comparing the fare structures you missed out that myki has myki money and myki pass, and you have to know when to use which one (I’m still not sure). Some of my colleagues carry two myki cards for that. With SmartRider you touch on and touch off and forget about the fares — the system figures out the cheapest for you. I think that’s a huge win for Smartrider. Also you didn’t compare costs very well. Cost to build PER CAPITA for SmartRider is around the $20 mark, and for myki it’s somewhere over $330. And for a system that’s still experiencing all these technical difficulties that’s disgraceful. @Stewart, basically a loaded Myki Pass will always activate if you make a trip that is valid for it. I’m not totally convinced that lack of an option on SmartRider is a win for it given the bigger discounts available on Myki by using a Yearly (especially with a Commuter Club discount). I would argue the per capita cost is meaningless because the PT mode share is (as I recall) a fair bit lower in Perth than it is in Melbourne. A figure factoring in daily users or annual patronage would be a better measure. But as I alluded, my intent at some stage to see if I can work out roughly how much all the equipment has cost, given there is probably more Myki equipment per Victorian PT user than there is SmartRider equipment per Perth PT user. I wouldn’t say the Myki slowness is due to Windows CE. It’s quite common in embedded devices. I wouldn’t be surprised if the other devices (like Perth’s SmartRider) are also powered by Windows CE. Took me 8 seconds to scan off at Mitcham this morning. The card was completely stationary against the reader’s surface the whole time. That’s mind-blowing. I have used smartrider for number of years and i like it. there are few issues but very infrequent. I like the lightening speed and reliability. Moved to Melbourne and started using myki and it has never worked in first attempt. Very frustrating… Myki feels like 90s technology. Especially as you need to touch several times to get it to work. There have to be major design issues or choice of RFIDs / detectors and software. Seems as if paypass and paywave are quicker in spite of being 10 times complex. Not by much and I think Perth is catching up – 83m boardings this year is a pretty serious load in a city of ~2m. Limited top-up points on the SmartRider network is less of an issue than you’d think, in practice. With the auto-load, users of the smartrider can quite happily set that up and then never really have to pay attention again, after which point it doesn’t really matter how many vendor stations there are. And since transport patterns in Perth are so centralised (“All Roads Lead to [Perth]”) most traffic will pass by those add value machines anyway for people that don’t use it regularly enough to warrant the auto-load. So as far as convenience goes, wouldn’t necessarily chalk that one as a particularly emphatic MyKi victory. @Nathan, thanks for the local info! Note that Myki also has auto topup. The figure I found for Transperth patronage is 144 million in 2011/12. With a population of 1.8 million, that makes 80 boardings per person per year. We know that over the past decade or so, Perth has been increasing fast… but it’s still a fair way off Melbourne, which is at 131. They just released the 2012 figures. I misread a value; the 83.2m was for Bus patronage; the train patronage was an additional 65m. Added together it goes up to 148m or so. But yes, 80 boardings per person is still well short of 131. Still growing though! (And with regard to comment 6, even when the 50% again number of boardings is taken into account, we’re still looking at a ten-fold price difference, which is pretty wild!). Unlike Myki, SmartRider cards are not visually different for concession card holders (except Senior Cards, if holders so choose). In order to get the concession, patrons must apply & provide proof, eg Seniors card, Health Care Card, Disability Pension Card and so on. Universities & schools issue SmartRiders with school ID attached to them. No SmartRider, no concession. For some concession holders, notable age & disability pensioners, all travel between 9am and 4pm is free on weekdays, and free all weekends. The $10 upfront cost is a minor issue. Over the life of the card it’s not significant: malfunctioning cards are generally replaced for free (& so they should). Speed of tag-on tag-off vs touch-on touch-off is really what matters to most people. SmartRider readers are generally reliable, so much so that many minor stations only have the one reader. Queues get through readers or gates very quickly even at peak times. SmartRider is quick & convenient, Myki isn’t. Also, Perth has this brilliant idea of free travel within the CBD. No tag on tag off needed, but even if you do you won’t be charged. It’s a bit different for the 6 train stations in the CBD: it’s free only if you use your SmartRider. If only the PTV would embrace brilliant like that. SmartRider wins hands down for me.